Got PAIN? What you need to know! How can you protect your back, neck, shoulders, and hands for a long and healthy career? Most dental professionals did not receive proper evidence-based ergonomic training in school to ensure a long & healthy career. This can lead to wasted money on non-ergonomic dental equipment, poor positioning techniques, and incorrect exercise that can result in a myriad of pain syndromes. Research shows that certain interventions should be implemented before others. 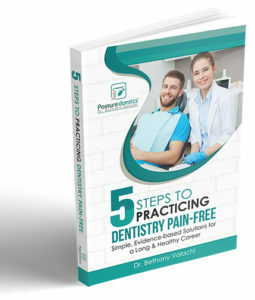 Dr. Bethany Valachi’s evidence-based eBook, “5 Steps to Practicing Dentistry Pain-Free” reveals how to eliminate pain, boost productivity and improve your quality of life! We will never sell your contact information. That’s just plain mean! Dr. Bethany Valachi has helped thousands of dental professionals for over 20 years, and is recognized internationally as an expert in dental ergonomics. Let Dr. Valachi help you work pain-free and take back your practice! Discover the NEW Online Video Courses - Get Instant Access Today!